Although life is so full and busy here and I barely have time to read, this is a wonderful book to pick up and put down. The whole family really enjoyed it. Learn and play naturally~ This is all about keeping play green in your house. It talks about the consumption of toys and play items. This is a topic I feel very strongly about and over laps with my own work making waldorf dolls. 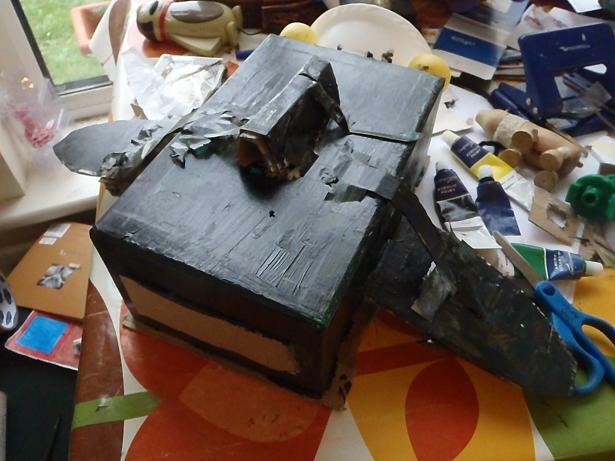 Obviously some kinds of toys are more harmful to the environment than others.The book gives fantastic alternative suggestions to filling your child's toy box with factory produced, plastic battery toys. It suggests choosing play things that are made from sustainable materials, or even simply buying second hand or accepting handed down toys, saving a lot of natural resources and landfill space. Of course letting children make their own toys is a great way to save the environment as well as giving them a fantastic creative outlet. I still maintain that a sellotape dispenser is one of the best gifts you can give someone age 4+. This chapter also encourages the joys of playing in nature and offers some wonderful suggestions to get your little ones outside to enjoy the playful and wonderful natural world around them. 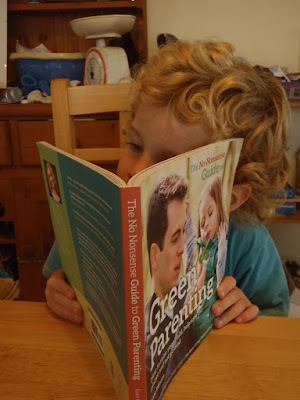 Your green nest~ I loved this chapter, it offers a host of simple ways that you can green your home without feeling that you have to invest vast sums of money in building a wind turbine or some such. 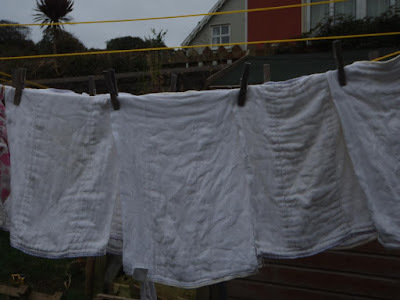 Suggestions such as natural (and inexpensive) cleaning products and making/ upcycling your own clothes (yes yes) as well as a host of energy saving tips are brilliant and practical ways that you can have a greener home (and save a lot of money too). Can I eat it now~ Often when we think about being green we think of the material possessions that we have and want around us, but of course the food we consume: where it comes from and how it is farmed is just as important. This was a really thought provoking chapter, and it has made me think again about our food choices. Of course breastfeeding is the most green way to feed Ena, but growing our own, seasonal shopping and not being wasteful are all things that have been brought back to the forefront of our minds. gorgeous rosehip syrup, packed with vitamin C and free! Hunter-Gatherer ~ How timely this chapter is, the world around us is bountiful with free food and we have been enjoying finding and eating the delicious treats the hedgerows and woods have to offer. There are brilliant recipe suggestions for every season in this chapter and foraging tips and advice. 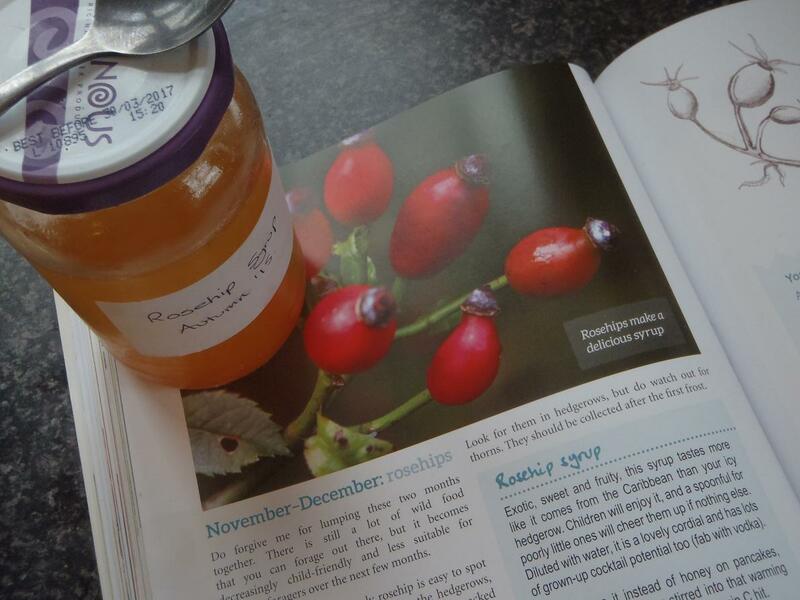 We have already made rosehip syrup, which the kids love on their porridge in the mornings and we will definitely be trying the nettle muffins too! Body Talk ~ this chapter was a wonderful confirmation that the way we approach our bodies is pretty green. It talks of cloth nappies (which we use exclusively) and wipes. I liked that the approach to this and all subjects in the book was gentle, and the author herself admitted that she didn't get on with cloth nappies. There are some more great ideas for natural treatments of minor ailments, and green alternatives to chemical laden bathroom and laundry products. Little green fingers ~ gorgeous gardening ideas about growing your own, minding garden wildlife and practical ways to build a bug hotel. How Nature can nurture your family ~ this is one of the most important chapters in the book I think. It is about getting our families out into nature. It lists ways we can engage ourselves and our children in the natural world around us. The bottom line is that for future generations to want to save our planet, we need them to care about it and love it and this will only happen if they spend time, happy time there as children. 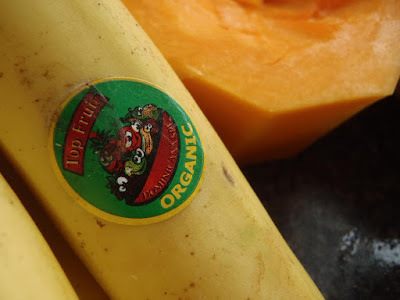 Green celebrations ~ I thought this was a lovely chapter to be included and gave some wonderful suggestions about opting out of the mass produced, wasteful nonsense that is aggressively marketed to us as the way to celebrate. The alternatives suggested by Kate are simple, home made and thoughtful and will definitely add a special magic to any celebration. Over all the book is a wonderful read, it has beautiful illustrations and photographs that the children have really enjoyed looking at. Garry loved this book too, he liked that it was affirming everything that we do, the small little efforts that we make. We also really liked that it was in no way preacher-y, I never felt that I was failing or felt judged when I was reading this book. It is not about what we are doing wrong, rather it suggests a million little ways that we can do it right, that we can be greener without too much effort, cost and ways that bring the family together and that are fun. For me the most important message was about love and respect for nature. Having solar panels on our rooves and an amazing eco car that only drives on waste bio oil is good going, but not realistic for most and is also arguably not as important as teaching the next generation about loving the world around us, understanding the impact our choices have and trying in lots of small ways to be greener. I highly recommend it, you can purchase a copy of the book here or here.